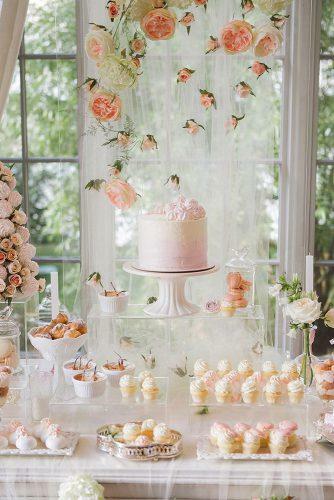 Want to know the hottest wedding trends? Well, you’ve come to the right place! 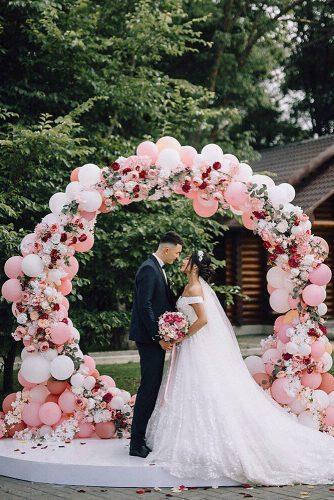 Trendy colors, top dresses and wedding hairstyles for 2019, any kind of wedding – minimalistic, modern one in neon and metallic, chic or rustic – all in one gallery. 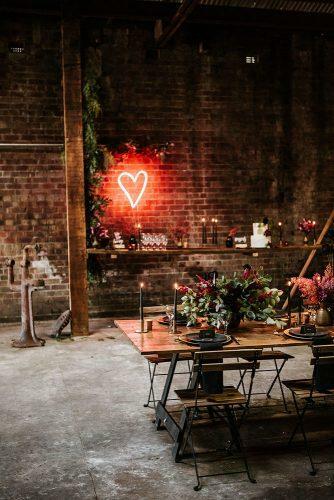 We have collected examples of the hottest wedding trends to inspire you and make every little aspect of your Big Day absolutely unforgettable. 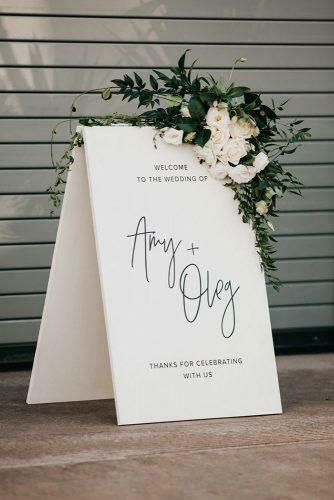 Top wedding trends 2019 – all in one place! You might have heard, that Pantone announced living coral as the color of the year. 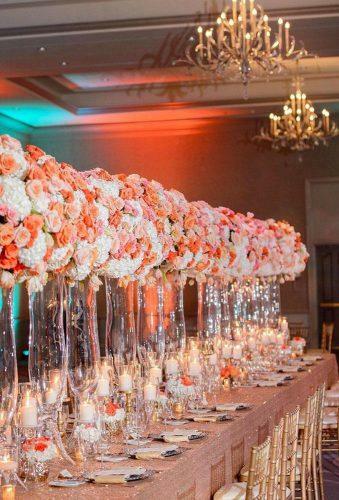 Vibrant, warm, buoyant, joyful and optimistic – this color is a great addition to any wedding theme. 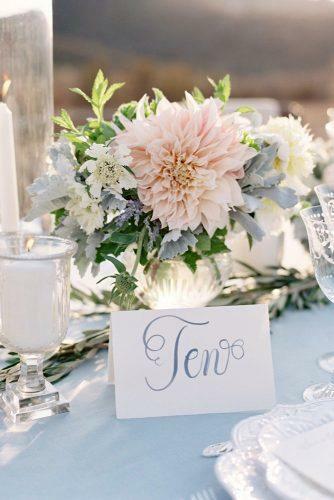 It looks amazing on invitations and wedding decor, adding romance, tenderness, and joy. 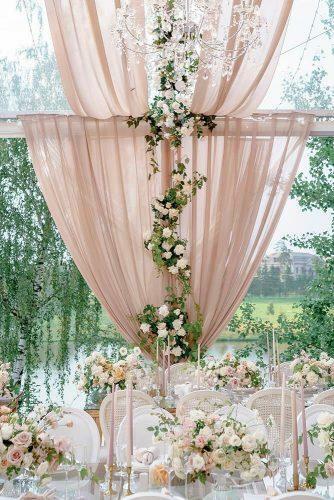 It also offers a perfect color scheme for your wedding flower decorations – from wedding bouquet to table runners. Use some of it in your cake icing – and embrace the style! Want to be original, but not ready to give up your dream of a traditional white wedding? Add some color elements! 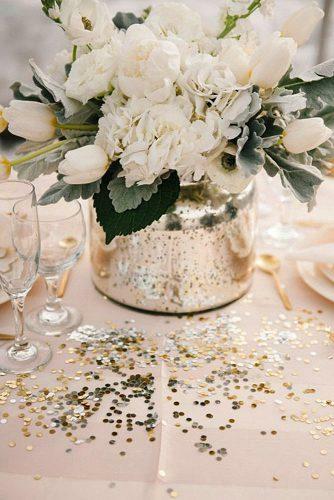 Every piece of wedding decor and each detail of a bridal look looks more stylish with some extra coloring! What are the perfect colors this year? Silver sage, mustard, and dusty rose! 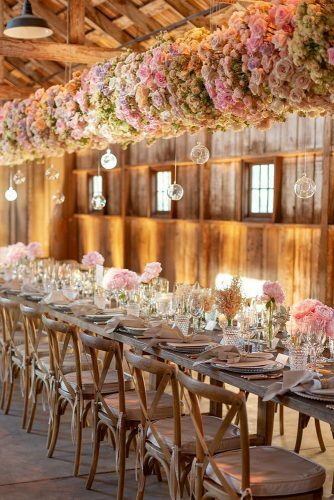 It might be hard to imagine how to incorporate them into your wedding design – so here are a couple of examples! Just look at how these gorgeous elements look at the photos! Definitely, something to consider for your own wedding pics! Treat yourself! 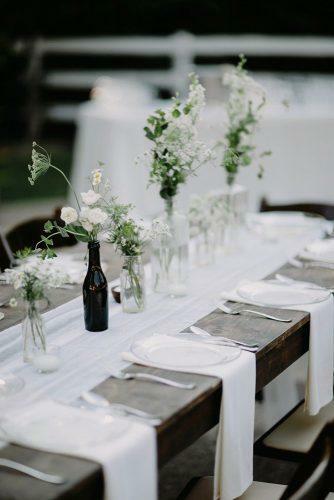 Bring in an element of surprise that will be both wedding themed and helpful. How to do it? Bridal Subscription Boxes! A great engagement present, or a treat for a busy bride. These boxes with monthly wedding themed goodies bring in an element of fun and surprise every month. 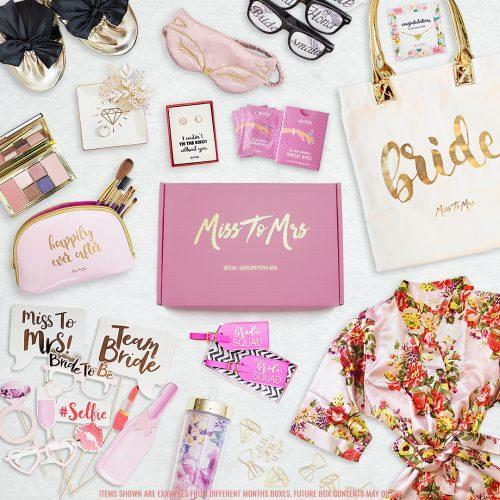 The Wedding forward team is crazy about Miss To Mrs Bridal Subscription Boxeses. A new theme every month, great quality of goods, and always something unpredictable inside! Want an example? Last year the brides received such awesome items like a floral kimono robe (great ideas for the morning after! ), “Just Married” car decal, bridal hairpieces, diamond wipes, and other fun & useful items. What is great about it is that you can use the items from the box during and after wedding planning. So fun! 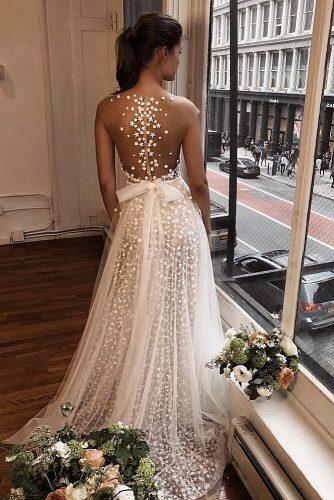 Want to know the hottest wedding dresses trends for 2019? First of all, this year is all about bold wedding dresses. No more boring wedding gowns! Be yourself, be original, don’t be afraid to stand out! Large 3D flower embellishments and huge bows for a bold bride. Super simple smooth silk dresses and bridal suits for a modern city hall civil ceremony. Need more? Ethereal multi-layered dresses with see-through bodices for beach weddings. And oh, you should take a look at these plunging v-necklines, going deep down right to the belly button. Word of the year? Sustainability! Eco-friendly materials, work ethics, and second-hand fabrics are all top fashion choices! 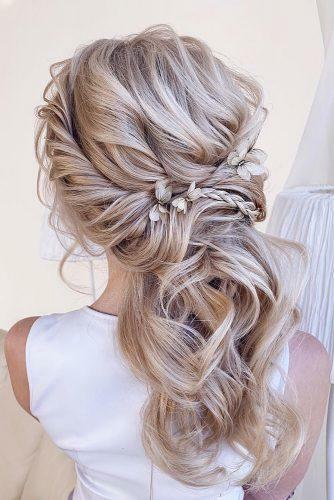 Boho and rustic weddings are definitely on the rise, and the style dictates every detail, including hair. 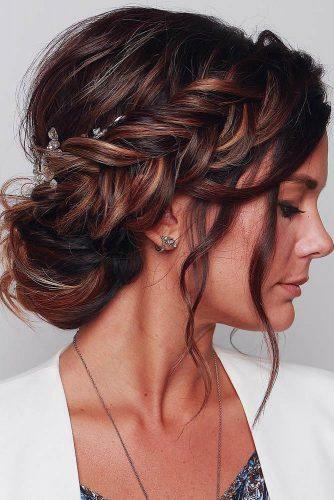 Messy updos, half up half downs and braids are especially popular this year. French braids, fishtail braids and all types of braided hair possible – in buns, in a ponytail, any way you may think about. Want to add some accessories? Make it either very simple – a large flower crown, or very delicate. 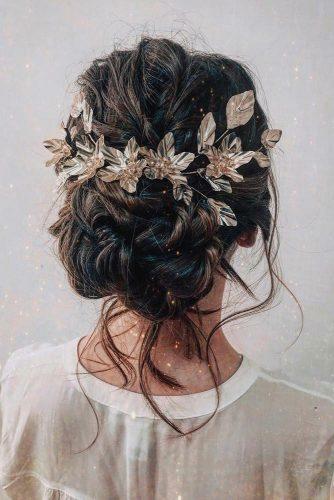 A bit of baby breath, woven into your hair, an intricate hairpin with leaves and flowers or a hairline will add style to your trendy messy hairdo. Want something super simple? Try a sleek ponytail. Or make your hairstyle as boho as possible with trendy mermaid hair coloring. 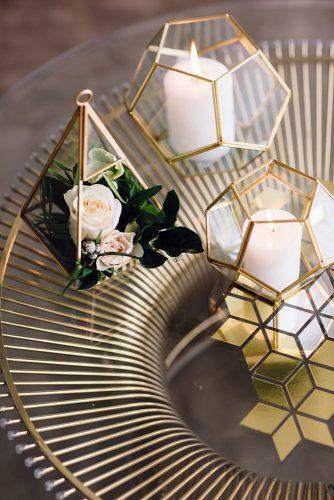 One more trend of this year is metallic details. It doesn’t matter which metal you decide to choose as the main theme. Just make sure all the details have the same color. 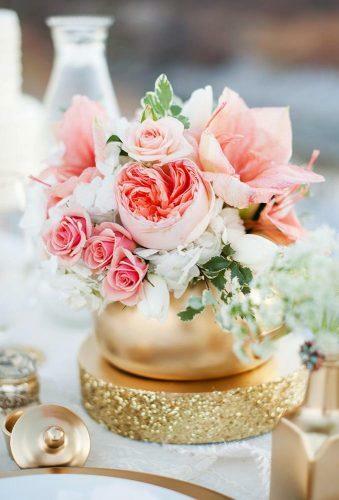 Gold, Silver, Copper, Rose Gold, Platinum, Titanium- all of these metallic colors are high on our list of trendy ideas. Still, if you want to know, which ones are the top ones – copper and bronze are metal colors that rule 2019. Warm copper shine brings coziness, while the bronze gives a bit of medieval flair to the design. 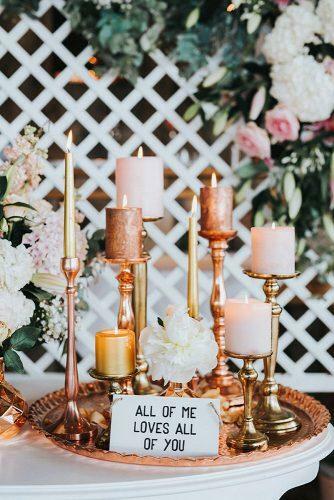 Just take a look at some of the examples – we are sure these shimmery wedding decor ideas will give you some inspiration! Minimalistic design and eco-friendliness are among the top trends in 2019. 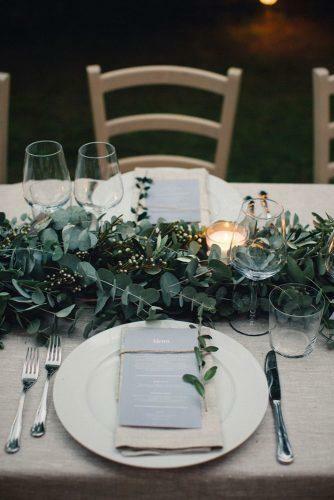 So it comes as no surprise, that the combination of these two trends by using wedding greenery in wedding decorations remains as popular as ever. A combination of egg-shell or alabaster white, and forest or fern green is especially popular. It adds style and elegance to your perfect wedding. Also, it is quite convenient because it has this very clear design outline, which is easy to follow. 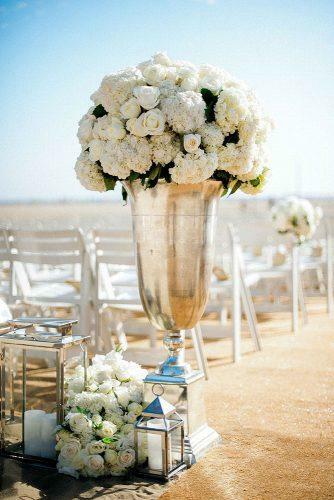 White and greenery minimalism adds style to any kind of wedding and is one of the most universal design patterns. 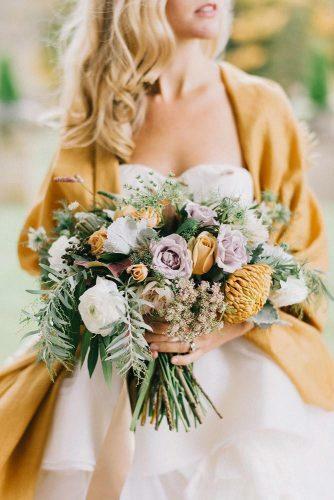 Boho wedding, country wedding, beach wedding, modern city hall wedding – you can apply this design to every style possible. A truly universal move! 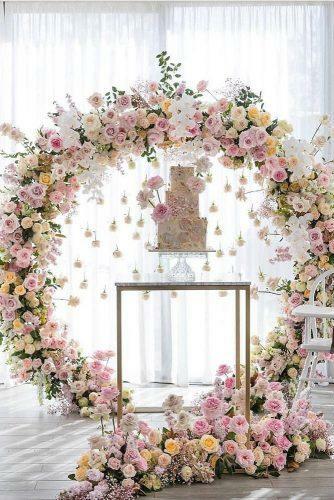 Which flower do you think, when you think about a wedding? 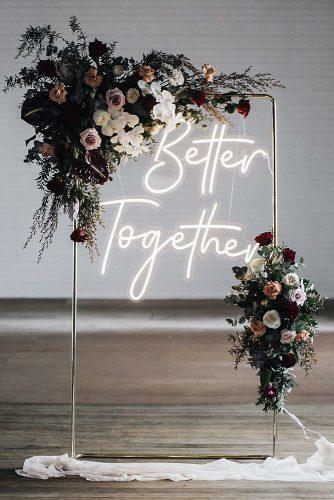 For many years roses ruled all the weddings – white, red… 2019 is here to change the stereotype. 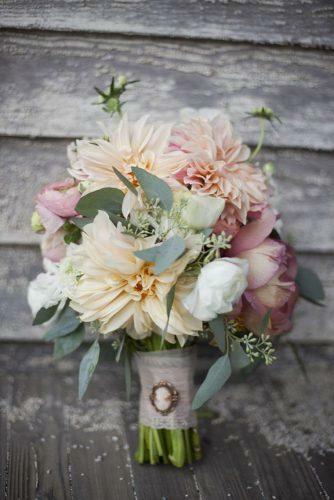 You would be surprised to learn, that the new queen of wedding flowers is dahlia! Why is that exactly? First of all, it has a range of vibrant colors, that can be incorporated into any color scheme, and beautiful shapes. Dahlias remind us of a star. Also, they add texture to any flower design, and probably a bit of cosmic charm to your decorations. After all, 2019 is all about color and texture, isn’t it? 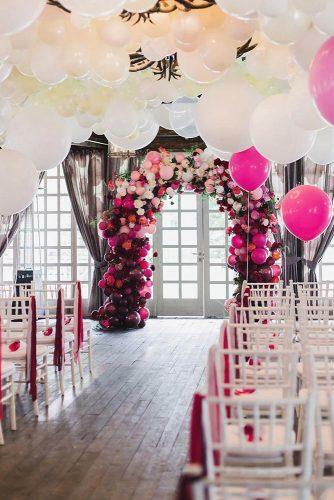 Balloons are typically associated with birthdays – but they make amazing wedding decorations! This is one of the newest and craziest trends. 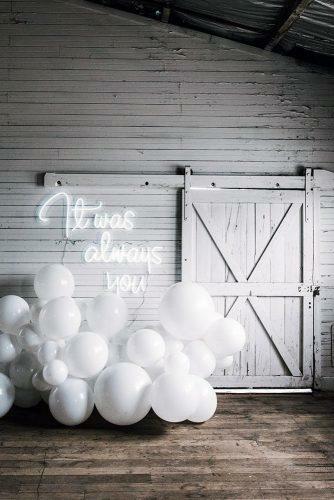 Before you disagree, take one look at these gorgeous examples of wedding balloon decorations! Aren’t they amazing? 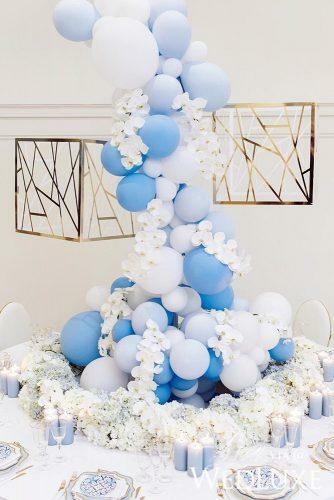 You can intertwine balloons with flowers, or order balloons-only decorations. 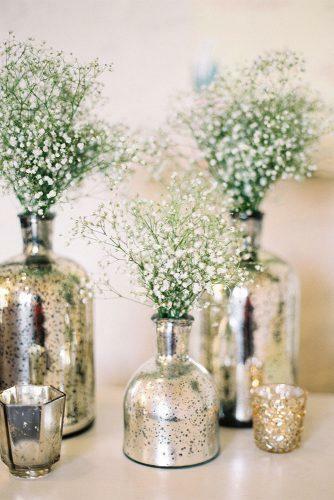 It is a great solution if you or your guests are allergic to flowers! 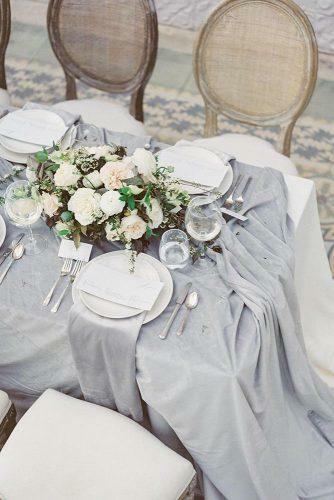 Add your wedding reception their soft, silky textures. Use them for bride and groom sculptures, balloon arches, columns, and centerpieces. Balloon decorations are great both for indoors and outdoors. 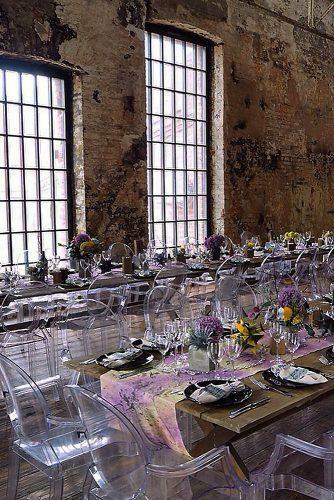 Planning the ultra-trendy event? 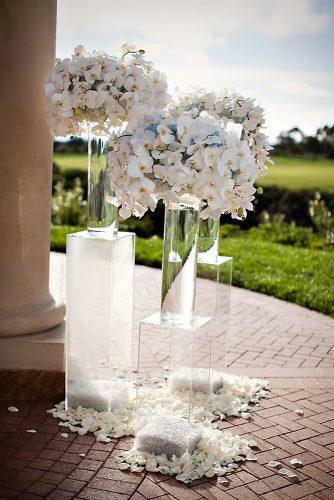 Clear acrylic elements will add style. These pieces of design look ultra sleek. You would be surprised to find out that they are also more durable than traditional glass. These decorations and elements are light and may look fragile, but they are virtually impossible to break. 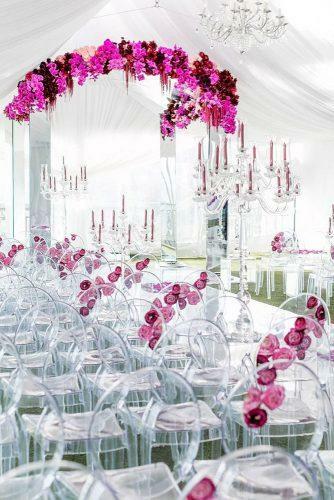 Clear acrylic elements give the impression of an expensive wedding party. Also, they will add style to any type of wedding. 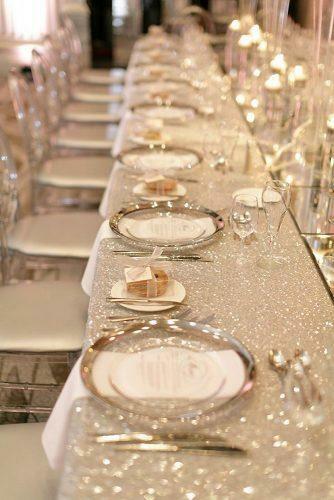 It will add elegance to a minimalist, low-key event. It can make even a lush wedding party one of the trendiest events of the year. 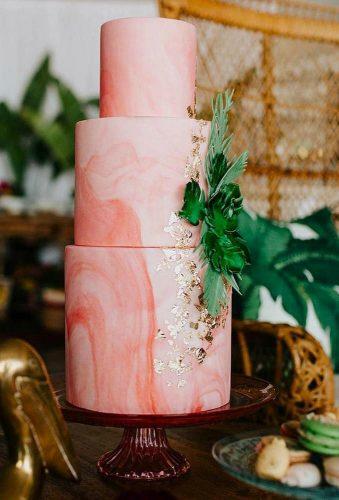 Planning a boho or a country wedding? 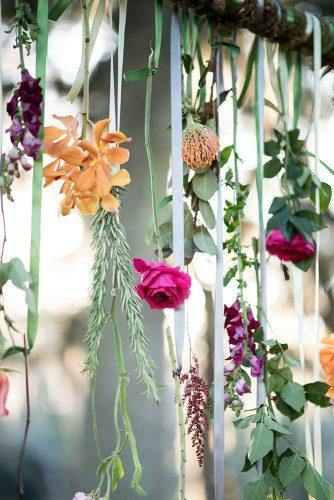 Hanging flowers decor can turn every location into a fairy tale forest, be it a backyard, a simple tent or a barn. 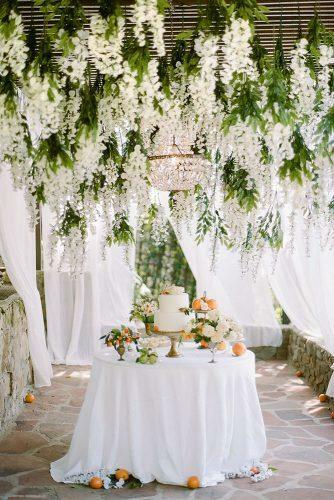 Wisteria flowers, hanging low from the ceiling, various flower arrangements, and even small potted plants – what can be more festive? Make your wedding guests feel the power of nature! 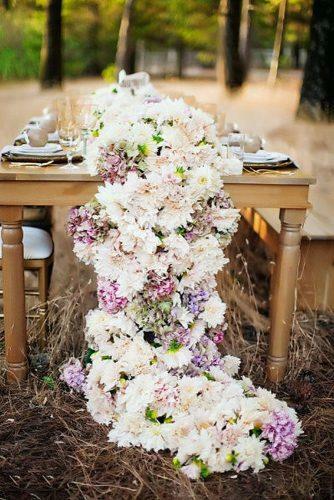 Flower decor is a great alternative to lush flower decorations, making this part of the wedding budget more frugal. 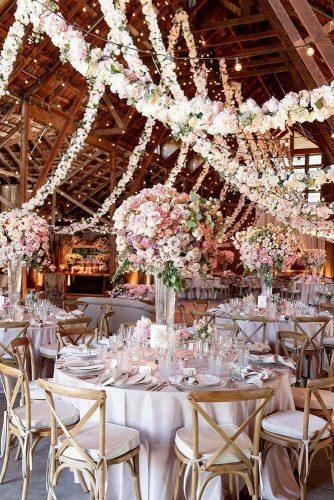 At the same time, hanging flowers allow saving money on expensive wedding locations. Turn your garden into the place of your dreams! Want to know the most special trend in 2019? Well, here it is – neon lights. Does it sound like a fashion disaster to you? Well, why don’t you give it a chance? Have a look at these stunning examples! 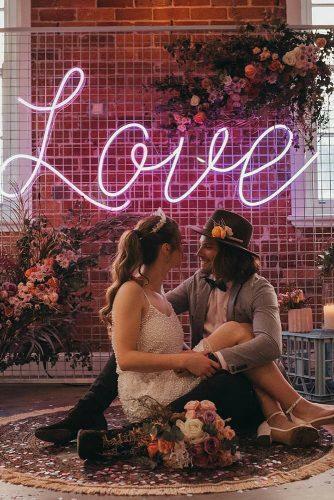 The neon wedding signs are trend number one this year. Add some lights into your decorations. 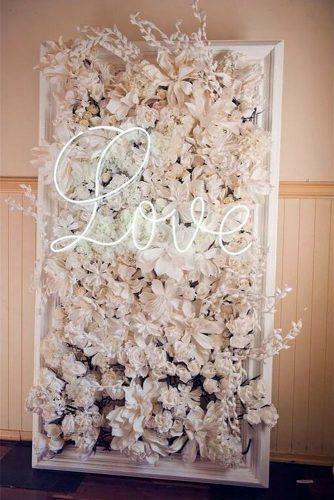 A photo area with neon signs in cursive lettering, rendered in pastel colors, make a great background for photos! 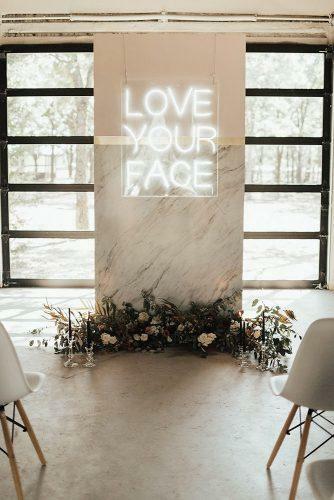 Use neon signs instead of traditional wooden signages for sweet romantic sentiments like ‘love you to the moon and back’, ‘happily ever after’, or ‘Mr and Mrs’.